Please see the calendar and events page for information regarding Blue & Gold and our Spring camp out at Cub Challenge. Please see the event sign up page for details on January's Pinewood Derby and the Cumberland Caverns camp out in February. Medical Forms must be turned in for all adults and children participating in any activity with Pack 002. Please turn in Medical Forms (Part A & B) to your den leader asap. The form can be found here. Please see our Event Sign Up page and Calendar for more information. Our annual pool party is just a few days away! We look forward to making a splash with everyone at the Legacy Park main pool on 8/29/18 from 5pm-7pm. Be sure to bring a friend that's interested in joining Cub Scouts! Troop 002 will be hosting our Webelos (4th grade) & AOL (5th grade) scouts at Proctor Landing in Acworth, GA on 9/21/18 - 9/23/18. This will be a great way for our older scouts to see how a troop operates at a camp out. 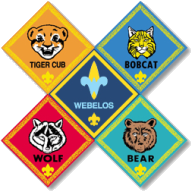 Webelos & AOL scouts also have the opportunity to get a taste of Boy Scout summer camp at Webelos Woods at Camp Woodruff in Blairesville, GA on 10/12/18 - 10/14/18. Visit our Event Sign Up page for deadlines and costs. Our fall camping will be to Spooky-Ree held at Bert Adams Scout Camp on 10/26 - 10/28. Deadline to register for our fall camping trip is 8/31/18. Please click on the Event Sign Up Page on the left side of www.pack002.com for more information on signing up. Annual Health Forms Part A & B will be due to den leaders by the September pack meeting on 9/11/18. Everyone that will be attending any event with Pack 002 (including scouts, parents, siblings, etc) are required to have a health form on file with Pack 002.